Schneider 60/150 lithium batteries settup? So i just started the installation of my offgrid system..but this is a lithium battery bank..im not finding clear setup instructions for the setting on the cc? Orion jr bms setup is next on my plate.. The Charger Settings Menu Screen is where you would select battery type, select Lithiunion from there settings can be adjusted for each charging stage, quote from the manual. As I'm still in the cell ballance stage, my controller is being used for lead acid currently, so have not entered into the lithium menu yet. Have you ballenced your cells yet, you would need to do that before even thinking of charing with the controller, a BMS is almost a necessity when doing so to prevent mishaps. Please note I'm not a seasoned with expert with these batteries but have studied extensively as well as being in contact with those who are, they have been gratuitous enough to offer their help and guidance. Interestingly enough we are both doing the same build with the same equipment, albeit mine is somewhat smaller 400Ah, 24V nominal, MPPT 60 150, SW 2524. You do have a Combox or SCP to program the controller with - right? So i have done that, and also set the high and low cutout voltage, but do i use a 2 stage or 3 stage charge profile? I do have the combox as well as the scp, and the auto generator start unit.. I would suggest 2 stage, Li batteries require little absorb time. But follow the battery Mfg's recommendation above mine. Attached pdf has some interesting information but it does contradict other schools of thought, other information read discourages bottom ballancing for off grid applications suggesting top ballancing as this is where the batteries will spend more time, as opposed to electric vehicle EV where there is high discharge without charging. As far as stages of charging there is an equal amount of opinions, the suggestions from the manufacturer of the BMS I purchased specifics a voltage 28.8V for 8 series, so in essence a single stage. Float voltage 28.7V or 3.58V per cell( 57.4V) , the transition to float will occur when current drops to 0.03 C, achieved by programming the total Ah capacity to 600Ah for my 400Ah bank, since the controller is fixed at 2% this would be the same, in my particular case. Rebulk voltage, I'm thinking around 28.6V( 57.2V) to stay within the 15% state of discharge, more or less. All these settings are available in custom settings, to the best of my knowledge, the voltages in is parentheses are to relate to a 48V bank, using the image as a guide. Some mistakes are possible in the translation to a 48V system and bare in mind this is a theological calculation, subject to change without notice. Yes that would present a problem in some cases, in my particular situation the only load during charging is the refrigerator which is an intermittent load, knowing exactly what ones system has in terms of loads would be an important factor. Thank you for the pdf, very informative. I did a top balance to the batteries when I received to 3.56v which is what the supplied chargers stopped at. (After load they taper off to 3.33v)Ive been on these batteries through just the inverter for 6 weeks now, and voltage reads 52.6. Started at 56.6v (after load about 53.2v)now with the cc programed and the arrays all connected, Im charging away. So now im working on connecting the bms unit, just waiting on the m12 ring terminals. Not sure what is meant by the current drop? ..... Not sure what is meant by the current drop? As the batteries fill up, they "draw" less current, and that current decrease (drop) is often used as the trigger to terminate charge. This is why I feel Li batteries are not ready for "prime time" yet. The BMS and Charge controllers do not talk to each other, the Change controller can source 60A to the batteries, and the BMS can only bypass 2 A. The other 58A overcharges the batteries and they go boom. A BMS that simply disconnects the charger, leaves the charger in a Invalid condition, where it's connected to Solar PV and no battery to run the brains of the CC. @bigblueshoe Found some settings which seem to work, see pdf, I chose the 10K cycle settings and monitored cell voltages carefully, they reach close to 3.400V, then float transition takes place, saved me a lot of time experimenting. System is running great guys thanks for the help, note that i think the voltage curve for my batteries is a little different from the curve chart shown in earlier post, my plateau seems to be between 55-54v and 52-51v as the batteries remain in this area for a long period of time when charging(days). I do have another question related to the schnider sw system, the combox communication on home network is great, however how is this use when abroad? Cant check system status or more importantly battery voltage? thanks in advance and happy holidays..
What settings did you end up using ? I don't know where the graph that @mcgivor posted earlier came from but it looks wrong to me. The voltages are far too high, looks more like a charge graph backwards at a high charge current. Most of charge/discharge graphs are done at charge rates of either 0.5C or 1.0C (500A and 1000A respectively for your battery). With your 4.5kW of panels your maximum charge current will be less than 0.1C. Your "plateau" figure are just right at low charge and discharge rates. Below are some charge/discharge curves for one of the Winston cells out of my battery. The setup that has been working well for me and many others for some time is a bulk voltage of 3.45V/cell (55.2V) and terminate Absorb when the charge current reduces to ~C/40. I use a float voltage of 3.35V/cell (53.6V). 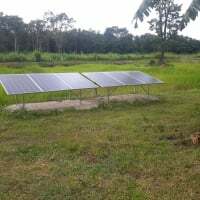 This will charge the battery up to around 98%-99% and hold it at this SOC until the sun sets. @karrak The chart posted dose appear to be erroneous, certainly looks like a charge curve in reverse, can't remember exactly where it came from, a search early in my quest for information. Your graph is a much better representation which corresponds with other information I've gathered since, your settings almost mirror the recommended ones for the Schneider equipment by Simpliphi, termination is however based on voltage, when 28V (56V) is reached it is held for 6 minutes, the actual battery terminal voltage is less due to voltage drop, cell voltage is ~3.45V. The recommended float is 27V (54V) 3.375 V, marginally higher, but very close, thanks for pointing out the discrepancy of the graph, your input is always appreciated. I think that for charge currents greater than 0.2C that 3.5V/cell (56V) is probably better than 3.45V/cell (55.2V) as you say to overcome voltage losses in the wiring and battery due to the higher current. Charging at 3.45V/cell at higher charge currents will mean the solar charge controller will go into CV (constant voltage/absorb) mode when the battery is less than 90% full which will reduce the current going into the battery and increase the time for it to be fully charged which is not such a good idea if you are relying on the sun to charge the battery. 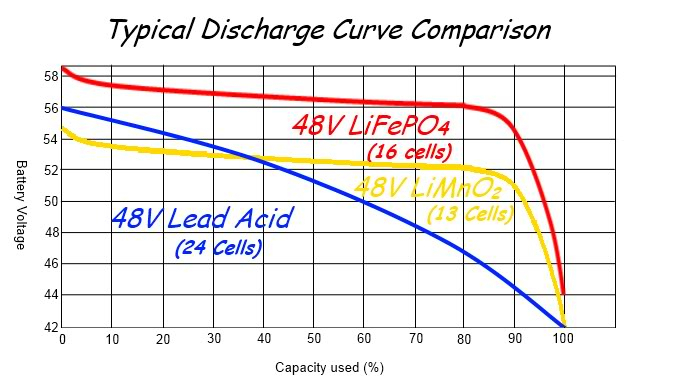 Based on obversations, which I watch with intensity, especially during the final charging stage, my charge current is approximately 0.1C, the individual cell voltage is 3.45V (27.6V) for 6 minutes before float 27V , I do understand that a higher current will offset the voltage to some degree, but it's the final balance that's important, a higher array current potential will influence the voltage prompting an early transition, however if the current is restricted the voltage will have less influence. Am i, we, deviating from the OP'S thread ? Simon you have some very useful information which all may benifit from, thanks for the input. You need to go to the Conext Insight webpage and create an account and a "site". You can then configure your "Web Portal" using the Combox and add your Combox MAC address to your "site" on the Inisght page. Then you can remotely view activity on your system. I use it to monitor mine every day.